It’s only been a fairly recent luxury with the internet and original Mods posting up rare and treasured photos from their sartorial heyday and stunningly researched tomes like Paul ‘Smiler’ Anderson’s Mods the New Religion with its own incredible selection of images, that enable us to see just how amazing and innovative the clothing was; especially in light of what had gone before, its sixties peak. Any fan of Modernist history and its Swinging London Carnabetion cousin though still likes to get their hands dirty though… (I suspect it’s the quality of the printing ink…) There is something about wading through vintage periodicals and magazines from the sixties that I find genuinely a pleasure. Stylistically even the adverts (irrespective of what’s being advertised) ache of the era. They are superbly illustrated and make me want to own the very shoes they stand up in… such is the power of advertising I guess! The other great treasure trove are the music mags. Chief among these is Rave magazine which knowingly mixes up street Mod with Pop Star style and is a great barometer of the changing fashions as it runs through from early ’64 monochromatic Beatle/Cliff/Rolling Stones looks with its skinny black ties and matching trousers to the mind-expanding conscious exploding rage of colour with the aforementioned Fabs and Stones being two of those at the forefront of the kaleidoscopic riot as the decade progressed (to be fair even Cliff’s ties were paisley by this time) to the dichotomy between the more earthy, organic looks and the space-age futuristic at its end. Browsing through them again and its hard not to get excited by the sheer dandified flare of the floppy hatted and sharp shod Brian Jones, the Velvet Victoriana of The Kinks and perhaps best of all those Darlings of the Whapping Wharf Landrette; Small Faces. In amongst the new pearly Kings and Queens of Lennon and McCartney (although check out George and Ringo for the best stuff!) is Dennis! Who he? 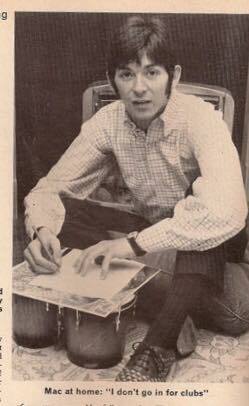 You may well ask… well Just Dennis was the regular clothes feature that appears in Rave magazine and its clear that its largely sponsored by the boutiques of Carnaby Street and whilst much is known about the King of Carnaby Street, and Mod-Millionaire John Stephen whose clothes so defined an era, little is known about the most famous of shoe sellers; Stephen Topper of Toppers Shoes. 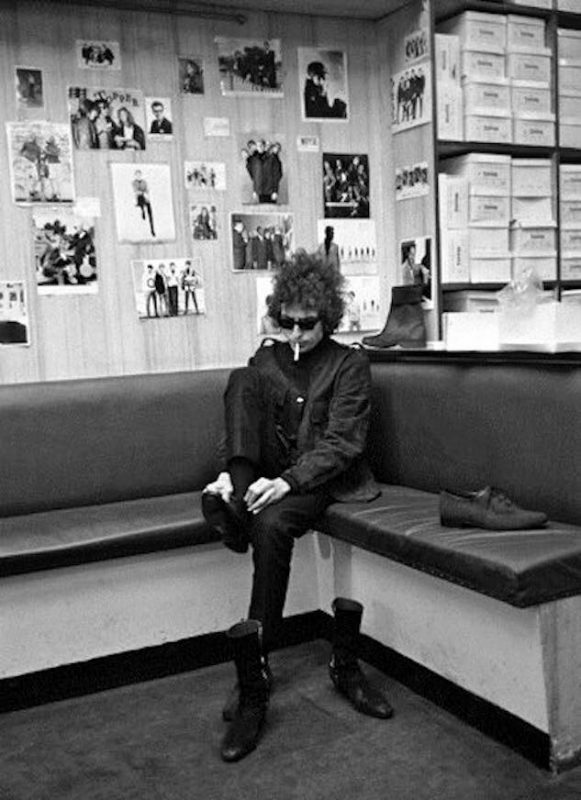 Toppers Shoes had a clientele of the good and the great with The Stones, The Who and The Small Faces regulars as well as international superstars who made a point of visiting their premises such as Jimi Hendrix and the new ‘Judas’; Bob Dylan. It is however great to read more recent articles on such web-pages as the Original Modernist FB page how much both Toppers shoes and rival (and next-door neighbour) Ravel were not just coveted but bought and actively worn on the high-street cat walks of the mid-sixties and beyond. 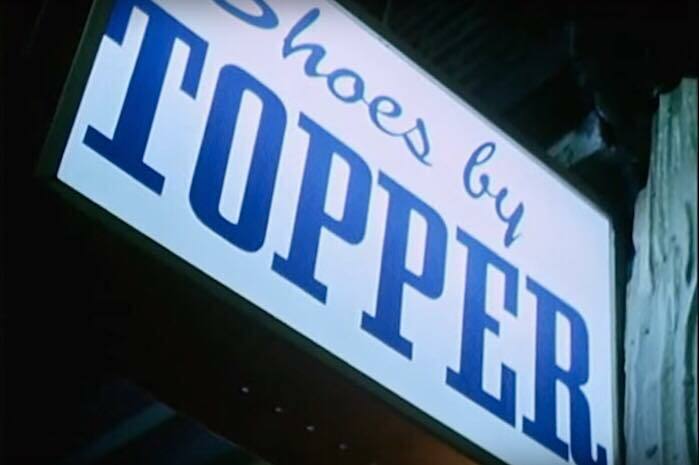 Toppers Shoes were already an established London concern with three branches in central London; one at 68 Queensway in W2 and the others at 34 Coventry Street and 57 Shaftesbury Avenue in W1. 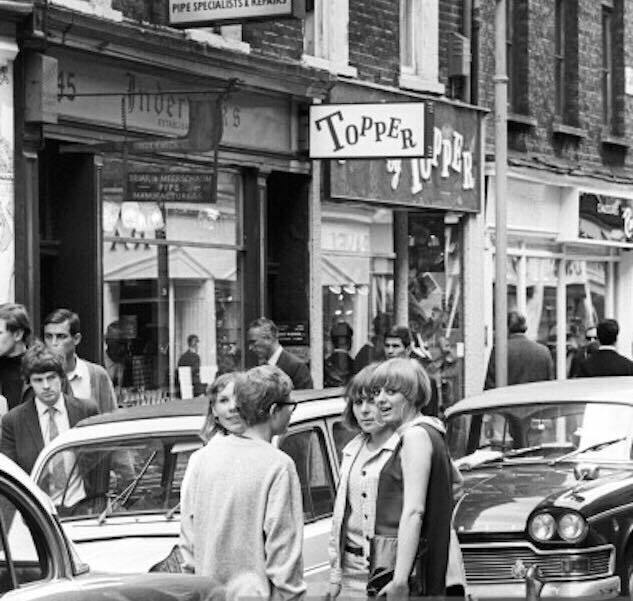 They made the leap into Swinging London folklore with a move to number 45 Carnaby Street under the stewardship of Stephen Topper the then still teenage son of the owner, in 1965. Six months later they feature strongly in the ‘London Swings’ issue of Rave magazine in April ’66. They also make the two era defining guides the pop-art Illustrated Ravers Map of London and the Gear Guide – the Hip-pocket guide to Britain’s Swinging Fashion Scene which denote the opening of a second branch in Carnaby Street at No 9 which catered for both men and women in its ‘beautifully cool interior of weird purply shades’ unlike No 45 which catered for men only. Prices ranged from three pounds to ten Guineas for men and for the girls from three pounds to five pounds-fifteen for shoes and from five pounds to seven pounds-nineteen and six for boots. It’s easy to see what was so attractive about the shoes. Designed by Stephen Topper himself and manufactured to a high standard in France, Italy and Spain they were intricate weaves of contrasting leather; almond toed perfection. 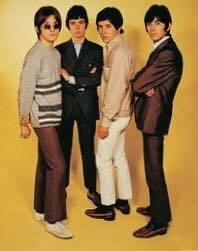 Viewing the colour photos of Small Faces at this time and you can see the weaves in cream and olive and outrageous black and lilac. Brian Jones, arguably the most flamboyant Stone also owned a pair. Contrasting fabrics and colours were a regular feature of his work and were the perfect complement to the rest of the clothes on Carnaby Street. A selection of Just Dennis articles reveals the eclectic mix of styles; from Sand Suede boots with waterproof leather lining, also available in black leather and olive suede (Price £7 19. 6d – Nov 1966). Two-tone loafers and two-tone brogues in Macao canvas and leather (Price 85s. – Feb 1967). Similar shoes in red-brown and black leather were available the following year at £5 9s. 6d. In August 1968 hessian slip-ons in Natural or Ice Blue were 59s 11d. Cord Boots in Camel or Brown also 59s. 11d and at a slightly cheaper 49s. 11d are Canvas slip-ons in White or Brown or lace-ups in Navy or Natural with all shoes being described as light-weight and ideal for the beach. Toppers shoes marched into the 70’s and continued to reflect the times with stacked heals and more bulbous toes and headed South West to the Kings Road (again reflecting the transition of the fashion centre of the era) but by the late 1970’s Topper Shoes and Stephen Topper himself seem to have faded from view. Thankfully the comparative ease of modern research and with the clear passion of some current manufacturers inspired by the innovation and style of Stephen Topper’s stunning shoe collections it is possible to once again buy shoes that make similar style statements. Who wouldn’t want to be in the elite company of The Rolling Stones, The Beatles, Dylan Hendrix and of course Small Faces.